He was wrong: I did, even though I left Stephanie-early (almost midday). First I walked 45 minutes out of town, then a farmer dropped me off in front of his ranch, where trucker Jorge picked me up to drive me to the edge of the Chilean tax-free-zone Punta Arenas. While he bought me coffee and a few kilos of chocolate [announcement: I’m the only woman in the Western Hemisphere that officially declared not to like chocolate, not even during that complicated time once a month – maybe I have a little phallus I never noticed after all] we loudly screamed along with his broad collection of 90s classics. ​After he let me out of his vehicle he waited a bit on the roadside to monitor the effect of the 140km/h winds on me, as he recently had witnessed a car being entirely lifted up by the Patagonian storms to be dropped down 100 meters further (one death, the rest of the passengers missing some eyes and legs). Fortunately, within mere seconds the first arriving car, containing an Argentinean family returning from a tax-free shopping trip, stopped to give me a ride passed the border to the industrial town of Rio Grande. Luckily, we were able to access the last boat to Tierra del Fuego, a part of Argentina completely enclosed by Chilean territory. Subsequently a woman with six traveling children drove me to Tolhuin, from where an amicable lawyer who could become a dad any second now drove me to Ushuaia (very fast, as you can imagine). Sometimes the trip is almost more impressive than the destination. Plan your own roadtrip here! ​Not when it comes to Ushuaia though. 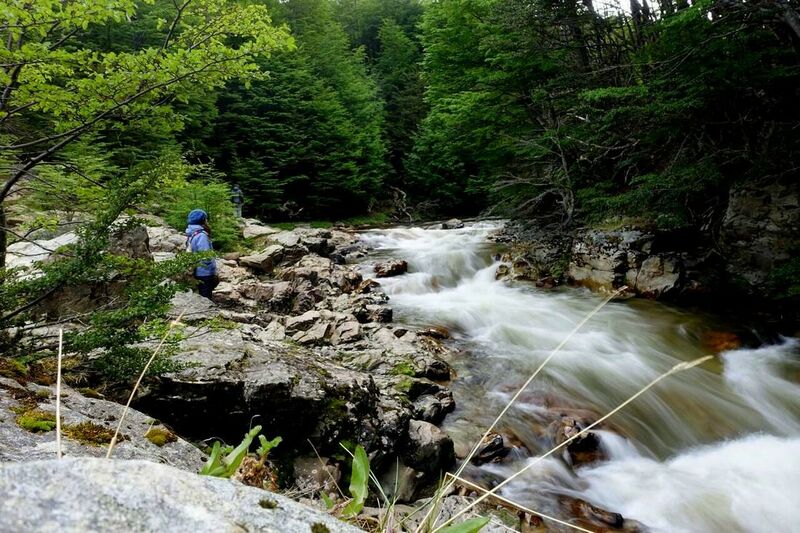 Ever wonder why this destination is swamped with tourists? Come down and have a look, I suggest, like everyone else. 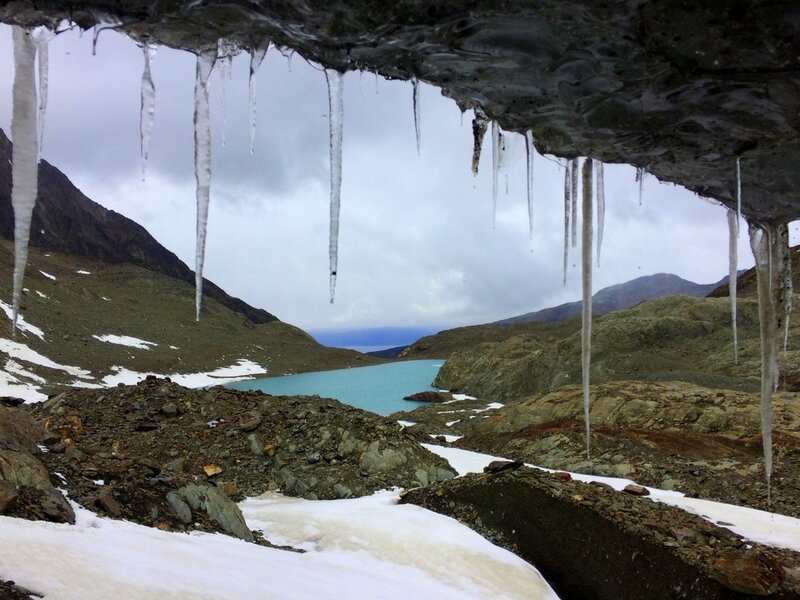 Besides the town being the major gateway to Antarctica (the only continent I have yet to check off, but a trip costs a shocking $5000 for 5 days – why oh why oh the misery), nature has some splendid surprises hidden for you right here. But none of that yet! I first had to meet my friend I had never seen before: Couchsurfer Manuel. On his way on picking up a few meters of empanadas he also loaded me in his Ford to drive me to a wooden house that seemed to come straight out of a Grimm fairytale. Once I opened the door I walked right into the arms of two other Couchsurfers: a Spanish couple in their early 60ies, ready for their trip around the world for the duration of a year… Couchsurfing, hiking, climbing, facing the adventure with an incredible pure and raw energy every globetrotter should treasure. These people showed me that age is indeed just a number if you live healthy and don’t allow your mind to imprison you. I order you to take a note right now & hang it above your bed: Never too old to travel. 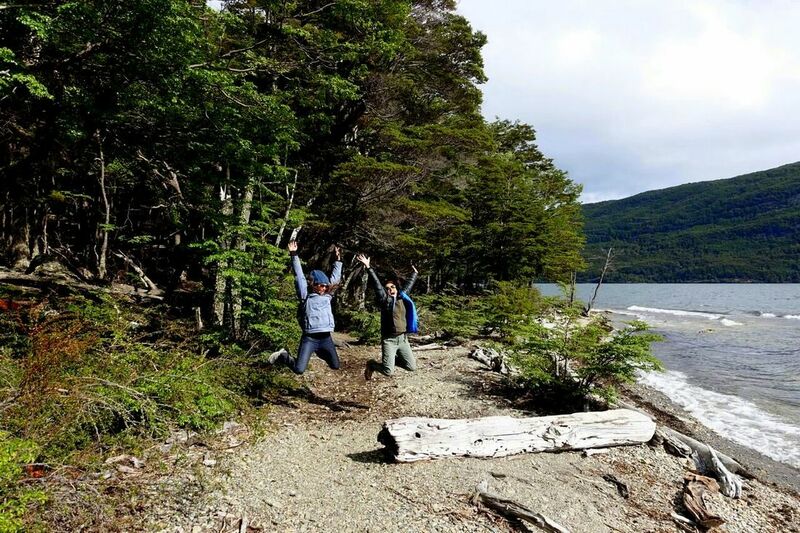 After the necessary food and wine exchange of the night before, I accepted the Spanish couple’s offer to join them on an exploration of Tierra del Fuego National Park. Me, naively thinking this would just be some freely accessible forest, was a bit shocked by the 210-peso-entrance-price. However, I bluffed myself through the I’m-Argentinean-act and paid the national price without having to show my non-existent DNI or the photos of my Argentinean husband and children I don’t have. I was glad the Spanish, who by the way have names: Alfonso & Maria, had rented a car as just like the El Palmar NP and Los Alerces NP this one was designed for vehicles to drive from viewpoint to viewpoint… the dusty roads with ongoing traffic making it a nightmare for hikers. The first mirador we halted at was providing us some look-outs on the Laguna Verde, which was indeed a green lake. 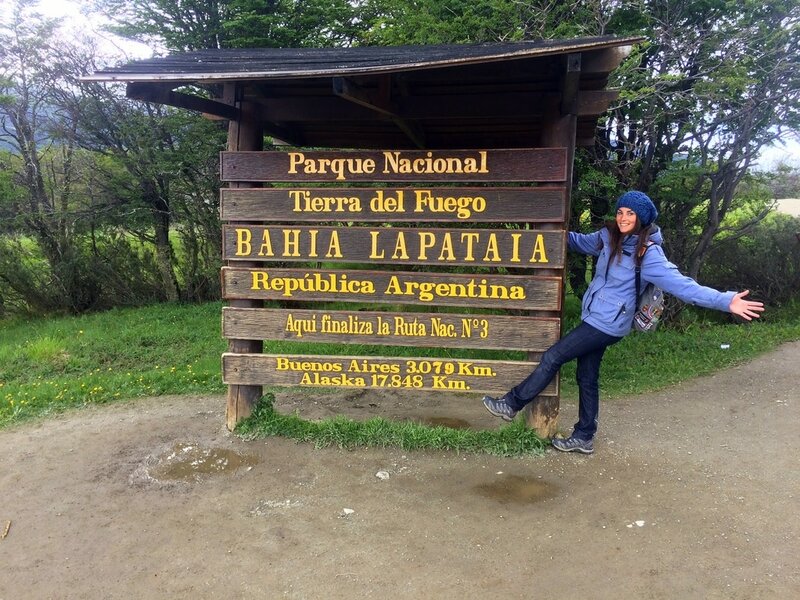 From there we continued to Bahia Lapataia, where the end of the famous Ruta 3 can be found. The other end is located in the capital city of Buenos Aires, which meant I was about to do this entire Ruta 3 by the thumb in the week that would follow. Zigzagging in between the tourist buses and crowdsurfing over the Asian masses we completed all surrounding short trails, which were too easy to really be a challenge, but satisfying in its observation opportunities nevertheless. Too bad the beavers had eaten most of the park away… no wait, let me rephrase that: Too bad humans had to intervene in nature again, without prior research or knowing what the hell they were doing, so they screwed up the entire eco-system which made beavers eat most of the park away. 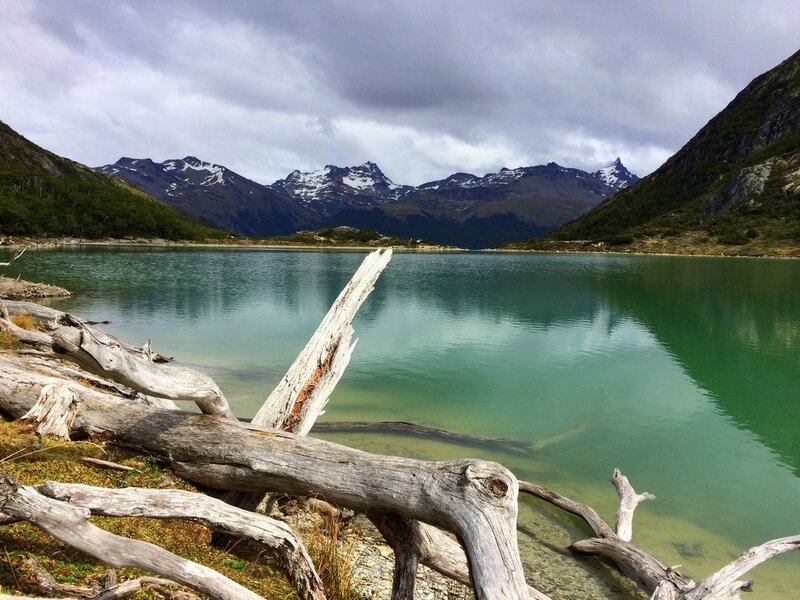 Ok, let me help you with those question marks trembling above your head: In the 1940s some self-proclaimed geniuses came up with the bright idea to introduce a non-native beaver species in this most southern part of Patagonia. Why? Well, to kill those b*tches and poach their fur, of course… animals are no living creatures, they are just a resource to serve our pleasures right? What they didn’t realize is that in a natural habitat that’s not their own they don’t have any predators and, on top of that, them naughty beavers like some good old hanky-panky. Don’t we all? Result: The beaver population exploded. Woohoo, lots of fur, give me fur daddy, I want fur! Na-ah, think again: Remember what beavers do? Build dams. And how do they get the materials to do that? They cut down trees with their teeth. Not really what you want in a National Park that’s known as holy indigenous territory. “But didn’t the Spanish kill all indigenous tribes here?” Oh yeah that’s right, let’s speak in our modern values of holiness then, moneyyy: Not really what you want in a National Park that generates more capital than the practice of robbing animals of their skin could ever bring in. Ahhh, great point! Ok, let’s all join forces and kill those bastards! That’s what they get for allowing us humans to bring them in, they should have told us this in advance, those jerk-beavers. Aren’t we a beautiful race? We gazed through the eaten down forests to spot a member of this imported fauna-population before their planned genocide, but they were nowhere to be seen. That reassured me: Keep running little workers, you’re by all means smarter than them! ​Thereafter we concluded the day by walking an entire trail classified as ‘very difficult’, which was in fact very easy, that brought us passed the border of Chile… which we crossed illegally because a sign said we couldn’t. Never too old to rebel. What else to do? 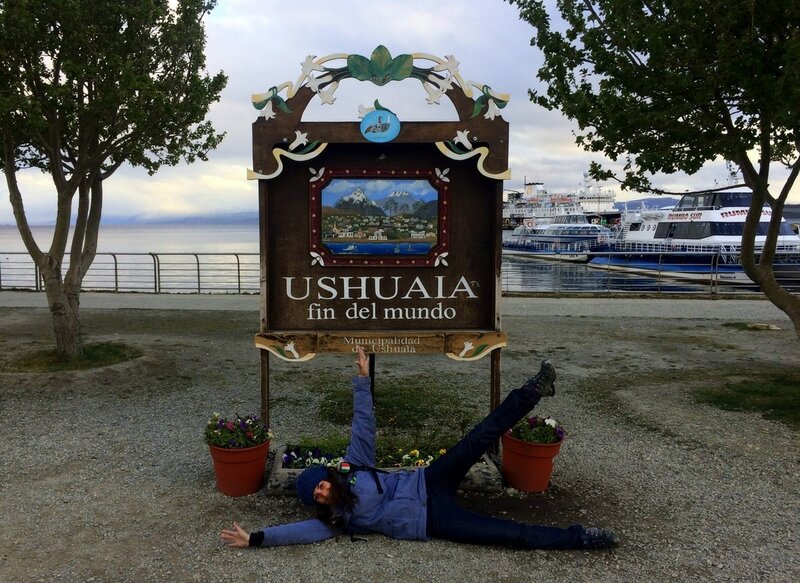 I browsed through the pamphlets of Ushuaia’s tourist office. Ugh. The day has yet to come I’ll pay $20 for a museum or ascend one of those embarrassing tourist double decker buses. Maybe I should just surrender and join one of those Trip-Advisor-favorites, a tour crossing the Beagle Canal? Uffff, my stomach already twists by simply hearing that word, TOUR, enticing prognoses of being trapped on a boat with those loud, Kodak-addicted masses, drowning being the only welcome escape. I’m spoiled when it comes to seeing penguins and sea lions anyway, no need to pay for it. The Ice Bar maybe… give me a break, why would you pay to get drunk in fake snow while the town is literally surrounded by glaciers and… Hey, wait what? Surrounded by glaciers? Where the hell am I waiting for, let’s climb a bloody glacier! I grabbed Maria and Alfonso by the hand and swiftly navigated to Vinciguerra. As the tiny glacier Martial, right into to town, was easy to climb and therefore touristy (because even the most obese or nicotine-addicted holidaymaker can get up there), we opted for this one that most of the locals never even heard about… which is weird, as it’s literally around the corner and, it has to be said, mind-boggling beautiful. The show started with stunning strolls through the flat fields leading to the thick woodlands. Horses grazed freely, showing every unknowing soul what the word ‘peaceful’ looks like. From there you enter the forest where you have to navigate through a slippery mud-minefield by the means of strategical jumps over floating branches and tree trunks. Once you completed that it gets a bit tougher on the legs, as the hike to the end attraction goes straight up with an unforgivable steepness. However, to say that it takes 4,5 hours one way… I wonder what kind of people they base those calculations on? We were up in less than two hours, not even tired. But sure, we’re talking about a vegan here, no wonder with so much protein. And the older Spanish couple then? I was almost (I said almost) struggling to keep up with them, these two were racing up with their flashy little walking sticks and plastic knees. Redefine ‘old’ please! They taught me age is just a number and your possibilities a concept in the mind: I want to be them when I grow up. 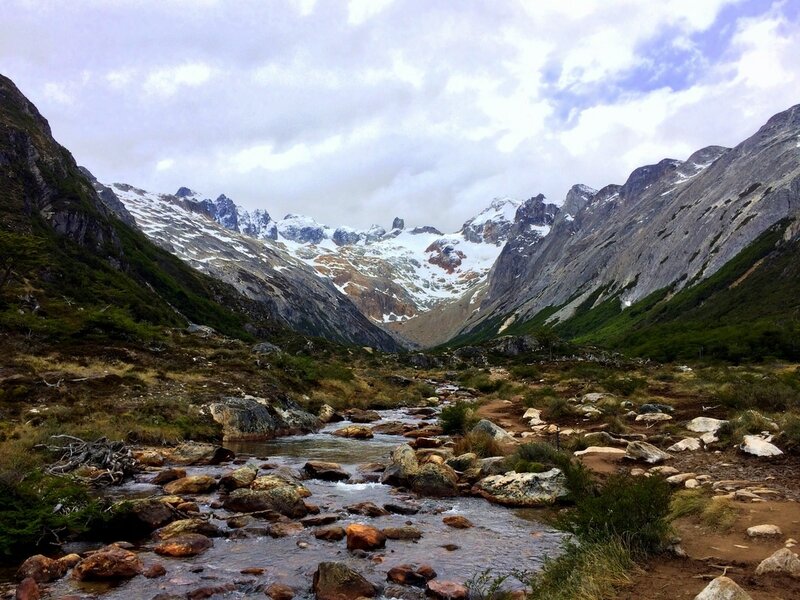 ​When we approached the Laguna de los Tempanos, maneuvering through the snow and ice, we came to an instant halt. Sometimes pure delicacy just slaps you in the face and leaves your brain stranded. As soon as we realized this is indeed reality we took control over our muscles again and continued our quest to some treasure that might lay ahead. It revealed itself in the shape of an ice cave… no wait, caveS, plural! Cave after cave after cave opened its crystal white cracks, the gaping mouths of the glacier. ​If that sounds awesome to you, you got exactly the right picture. We were exhilarated. 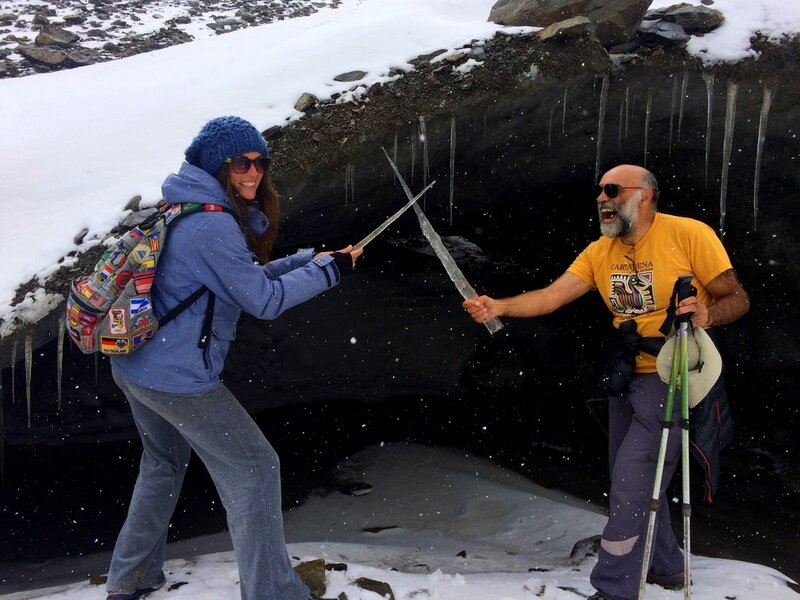 We ran in and out, threw snow up in the air, held sword fights with icicles, slid down the ice formations. Little finger to that Ice Bar, I was inside a glacier. On the scale of memorable: on 1-10 an 11.
have as many days as most people have money, so after a day of rather insignificant museums (Museo de la Ciudad, Casa Beban etc.) I opted for another hike, this time to Laguna Esmeralda. One can never see enough lagoons, not in Patagonia. With 3 different hitchhikes I reached the entrance that’s located about 15km outside of town… or what I thought was the entrance. 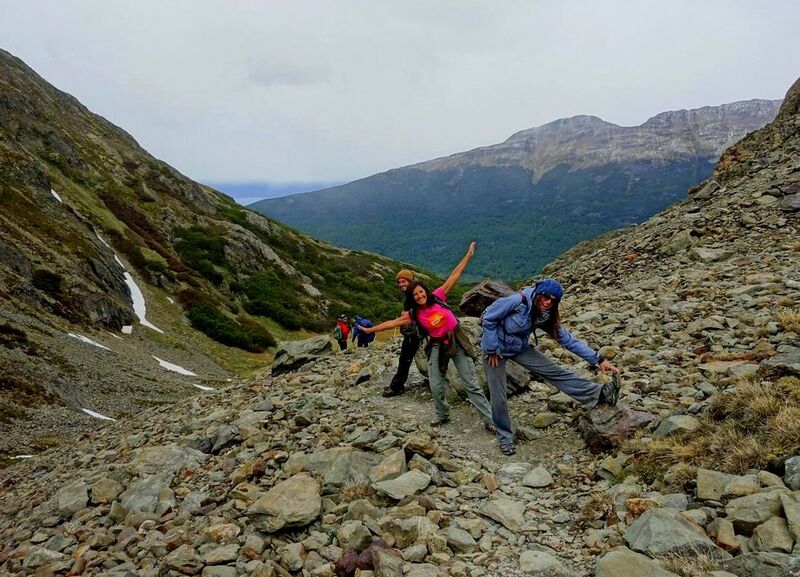 In reality I had to fight myself through dense lumber and stinky swamps, mercilessly whipped in the face by sweeping twigs, before I reached the commercially exploited ‘Valle de Lobos’ which marks the beginning of the trail… representing the deepest low of entire Ushuaia. This is a place where dogs are bred in small cages to (ab)use them for sleighrides. I think everything in that sentence is wrong. If you want to learn the truth about this ‘tourist hotspot’ I recommend taking a deep look into the eyes of these animals, expressing everything but happiness. Once you opened the cages to set these captives free (let’s all just do that from now on) you can follow the blue signs marking the fairly flat and easy route through immaculate scenery. I was glad Alfonso and Maria had lend me their Nordic walking sticks to steer myself through the muddy marshland, speeding me up as an extra bonus (I’m going to get myself a pair of those badboys). Within an hour I was there… I guess those estimated four hours were a bit over the top. Like all Patagonian lakes, this one was a stunner too. I just can’t grasp it, what’s up with this part of the Earth? Why are the colors so intense here? I gladly accepted the opportunity to hike around the lake and return via a different path, that wasn’t a path at all. I got entirely lost. Which is exactly what I needed. You see, as this hike is easier it also means it’s more popular, which means you’re surrounded by screaming people instead of screaming silence… any way to escape that is welcome. I had no idea where I was going and in the end it took me trice the time to get back, but I uncovered a pristine element of our planet that was yet unknown to me and I guess to many others. ​Just before the night fell I was back on the highway, accepting a ride from a man without legs who was nevertheless driving a car. “They told me I should take a wheelchair and let my wife help me lead my life. I told them they could speak for themselves, they’re more handicapped than me with limiting ideas like that. Even without legs I can kick their arses.” Hoppa, high five you brilliant legless savage! We got life! That night I let Cristian, Manuel’s son who happened to be a talented metal musician, open the final chords to my stay in enchanting Ushuaia. While he let his guitar weep and scratched his throat with the deepest soul-awakening grunts I oversaw my stay, brought to life by natural revelations and meaningful encounters like this one. It’s out there. I’m glad I came down to take it.